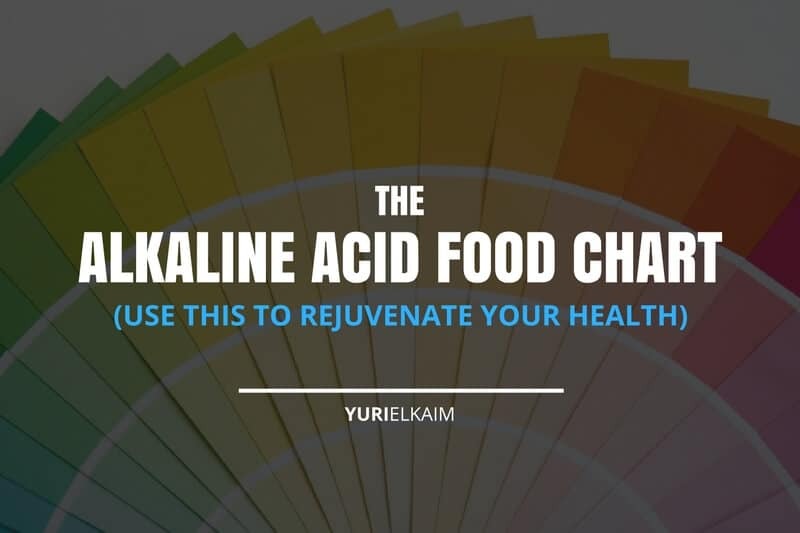 The words “acidic” and “alkaline” sound like they belong in a chemistry lab – not on your plate. But these terms make up the core of the alkaline diet, which puts the focus on maintaining a healthy pH level to promote overall health. Why does having a healthy pH level matter? Following an alkaline diet is one of the best things that you can do for your health. From cancer prevention to boosting energy levels, an alkaline diet is full of benefits. 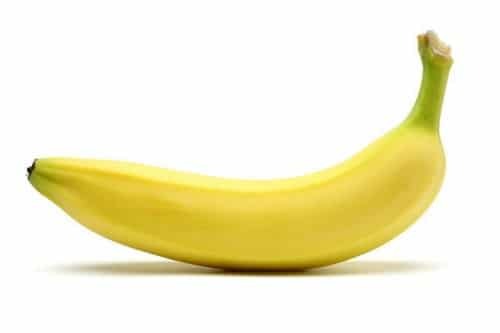 Before we get into the “how” of the alkaline diet and look at some alkaline vs acidic foods, let’s start with the basics – (nerdy) pun intended. Our bodies strive to maintain a very specific pH level, which is a measure of the acidity of our blood by looking at the concentration of hydrogen ions. Levels can range from 0 (very acidic) up to 14 (highly alkaline). The optimal pH for our body hovers right in the middle around 7.35 to 7.45, which is considered neutral. Our kidneys work hard to sustain this balance – or homeostasis – and regulate our pH level by excreting extra hydrogen ions into the urine and reabsorbing bicarbonate from urine. If the kidneys fail to do this, falling out of that tight 7.35 to 7.45 range can have serious effects on health. Acidosis, which occurs when the blood has an increased level of acid, can wreak havoc on the body and can even be fatal in severe cases. Symptoms include rapid breathing, fatigue, confusion, jaundice, a decreased appetite, and an increase in heart rate. Not only that, but cancer cells and disease thrive in acidic, low-oxygen environments. Throw them into an alkaline environment rich in oxygen and they’ll never be able to survive. This was proven in the early 1900s by Otto Warburg, a scientist who won a Nobel Prize for his research in the field (1). This is why it’s critical to create a healthy alkaline environment that promotes good health while warding off chronic disease and inflammation. But how does one achieve an alkaline environment in the body? The best way is through the diet. Just as our diet has a profound impact on virtually every other aspect of our health, it also can affect our body’s pH level. 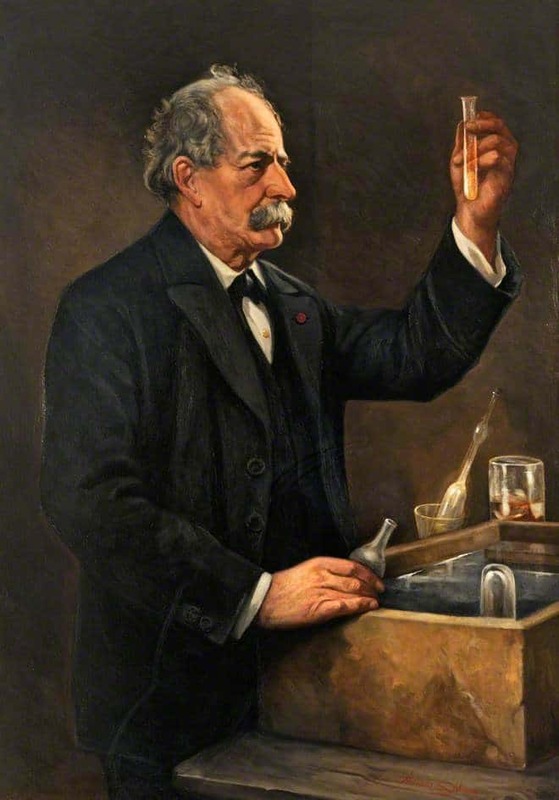 In the 1870s, scientist Marcellin Berthelot used a machine called a Bomb Calorimeter to analyze how much heat was produced during chemical reactions. He used this machine to incinerate different foods, which produced an ash-like substance. By mixing the ash with water, Berthelot was able to test different foods and determine their pH levels (2). He found that most plant-based items, including many fruits and vegetables, had a higher pH and were more alkaline while meats and other processed foods typically had a lower pH and were more acidic. It was these findings that really set the groundwork for the alkaline diet. The alkaline diet encourages the intake of more alkaline-forming foods, such as plant-based proteins, fruits, and vegetables. It also limits foods that are acid forming in the body, which means less meat, grains, and processed foods. This promotes a healthy pH level. The benefits of the alkaline diet go far beyond a healthy pH level. 1. 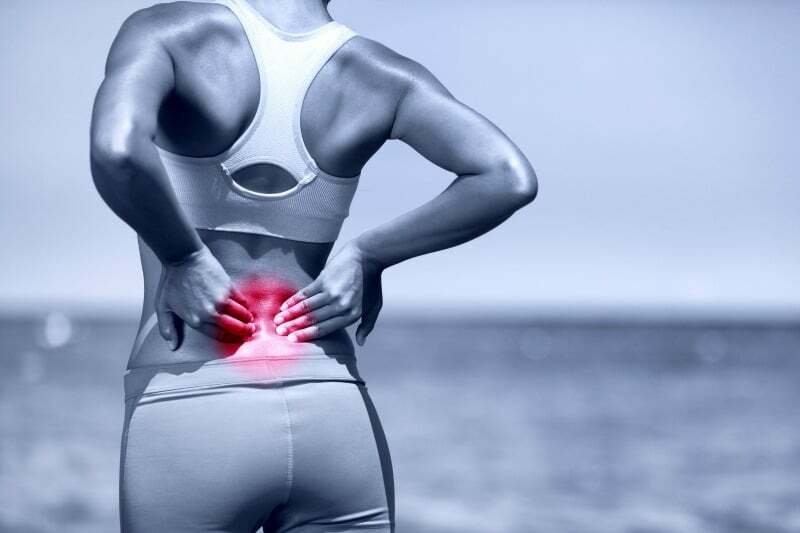 It alleviates chronic inflammation and pain. Acidosis has been associated with back pain, joint pain, chronic inflammation, and even headaches. Studies have shown that restoring acid-base balance can ease negative symptoms while relieving pain and inflammation (3). 2. It reduces blood pressure and improves cardiovascular health. Research has found that a diet high in acid is associated with an increased risk of hypertension. 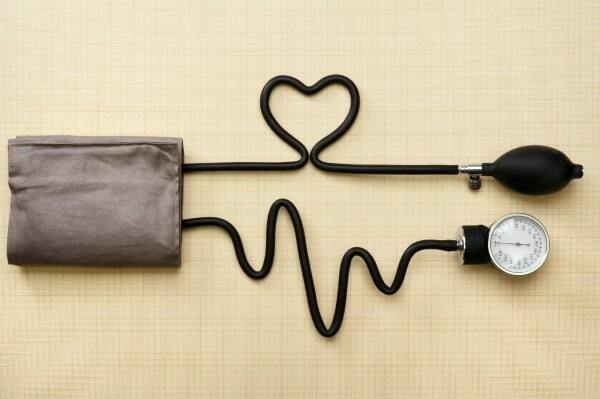 Following an alkaline diet can reduce inflammation while dropping blood pressure and keeping your heart healthy (4). 3. It can prevent the development of cancer. Cancer cells love acidic environments and actually depend on them to survive. Following an alkaline diet can help shift your pH to prevent cancer development. Plus, the alkaline diet is rich in fruits and veggies, meaning you’ll be getting tons of cancer-fighting antioxidants through your food as well. 4. It promotes strong bones. Reducing your dietary acid load by following an alkaline diet can actually help you have stronger bones. In fact, studies have shown that a low acid load is associated with an increase in bone mineral density and a lower risk of fractures (5). 5. It increases vitamin absorption. You’ll get plenty of alkaline minerals, like magnesium, calcium, and potassium, in the alkaline diet. These vitamins are crucial for many different functions throughout the body, from the formation of bones to supporting immune function. Plus, getting enough magnesium can help with the absorption of other vitamins, like vitamin D, making it easier to meet your needs (6). Guessing which foods are alkaline and which are acidic seems like it should be simple enough, right? Lemons, for example, must be acidic because they’re one of the most tart and sour foods around. Unfortunately, it’s not quite that simple. Even though lemons may have an acidic taste, once they’re digested in the body, they have an alkalizing effect and raise the pH of the blood. This is where an alkaline food chart can really come in handy. 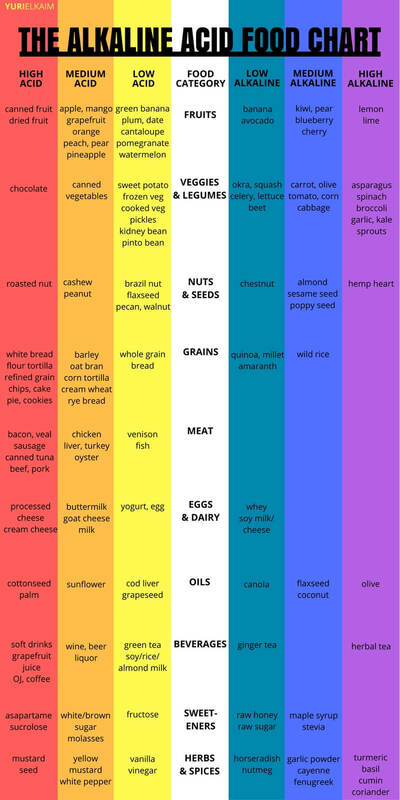 Paired with an acidic foods chart, you have an awesome visual for which foods you should limit and which foods are brimming with alkalizing health benefits. “Alkaline forming foods” are further broken down into low, medium, and high alkaline foods. These foods are the best choices if you’re looking to really take advantage of the benefits of an alkaline diet. Meanwhile, foods labeled as “acid forming” should be incorporated into your diet in moderation. Similarly, these foods are grouped into their degree of acidity, from low acid to high acid. While they are categorized as acidic, this doesn’t mean you need to cut them out completely. Enjoy these foods in moderation, and take other factors, like overall healthfulness and nutrition, into consideration when determining if they should be part of your diet. On the other hand, these foods should be included only in limited quantities in your diet. These are foods that will increase acid load in the diet and are usually not great choices to have in excess in a healthy diet anyways. It’s true that a healthy diet is critical for creating an alkaline environment. But there are other habits that can also increase acidity in the body and cause plenty of harmful side effects. Try to limit these to improve both your alkalinity and your overall health. If you take a look at the alkaline acid food chart, you’ll notice that the most alkaline foods are the ones that we should all be eating more of anyway. Fruits and vegetables top the list while meat, dairy, and processed foods end up being pretty acidic. However, taking advantage of the benefits of the alkaline diet doesn’t mean you have to prescribe to a totally raw, vegan diet. They key is moderation. Personally, I eat meat on a fairly regular basis and yet I still follow an alkaline diet; my diet is full of the good stuff with some of the acidic foods included in moderation. 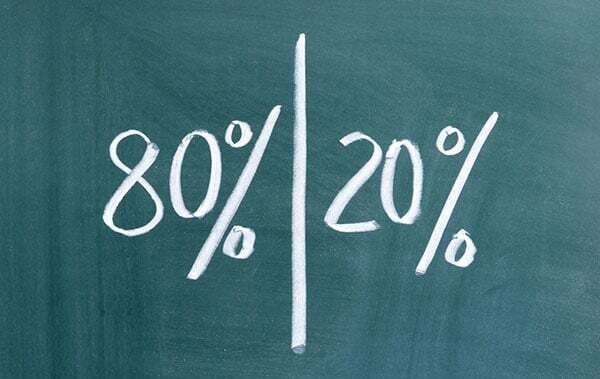 Going for a ratio of about 80 percent alkaline foods with 20 percent acidic foods is a good rule of thumb to follow. And you’ll notice a few healthy foods on the acid-forming list. Don’t totally nix them from your diet just yet. Maintaining a healthy acid-base balance is about just that: balance. Apples, for example, may be considered slightly acidic, but they have plenty of vitamins and minerals that make them a worthy addition to any diet. In the end, as long as you’re getting in plenty of servings of fruits and veggies, chances are you’re doing pretty well to help your body maintain its healthy pH level – and helping with your body’s overall health in the process. Want to jumpstart your alkaline diet? Try my delicious 1-Day Detox, which is a healthy “cleanse” that will leave you feeling energized and lighter by tomorrow. You’ll enjoy healthy, delicious meals while cutting the food clutter your body doesn’t need, eliminating cravings and that bloated feeling. You can download the detox right now – for FREE! – clicking the banner below.